Peter Highman is going to become a father. He and his wife had everything planned out when he left for business in Atlanta. All he needed to do was fly home to Los Angeles by Friday in order to make the planned c-section and Peter would witness the birth of his first child. Peter never planned on meeting Ethan Tremblay however and after being put on a no fly list and losing all of his belongings, Peter is forced to set out on a cross-country trip with the very man who put him in the situation. "Due Date" is a comedy that thrives off the chemistry and performances of its two leads but suffers from bringing nothing more than a re-tread of the road trip buddy comedy. Sadly the Todd Phillips film brings nothing new to the table outside of two different faces in very similar situations. In defense of all writing parties involved (Alan R. Cohen, Alan Freedland and Adam Sztykiel), to pen a road trip buddy comedy in the shadow of a film like Planes, Trains and Automobiles is no easy task. The classic John Hughes comedy does everything and takes the two characters through numerous situations that are hard not to be compared to. Especially a road trip comedy that hinges on two characters who are stuck together. One of which is very unsuspecting or seemingly dimwitted, while the other is very uptight and has no room for dilemmas. This time around Zach Galifianakis plays the unsuspecting character and Robert Downey Jr. plays the more tightly wound character. Both Galifianakis and Downey Jr. are spot on in their roles. Galifianakis does come across very similar to his previous character in the last Todd Phillips buddy comedy The Hangover, however it is clear the character was penned with exactly Galifianakis in mind. Galifianakis's shtick is sure to again generate plenty of boisterous laughter throughout the 100 minute comedy. Robert Downey Jr. who also is no stranger to comedy plays off of Galifianakis with absolute precision. His high strung demeanor is a riot to watch. Every fumble that Ethan (Galifianakis) makes just brings Peter (Downey Jr.) that much closer to boiling over and when he does, it too is nothing but belly laughs. The situations that Peter and Ethan go through from Atlanta to Los Angeles are funny and generate plenty of laughter, but will go down as my biggest gripe with the comedy. I'm not going to run through each and every situation because for one, that would ruin the movie for each of you and two, its too easy to point out how this scene can resemble that scene from one road trip comedy to another. Movies like this are common. One seems to come out every two years, so writing new situations and material is becoming harder and harder. Screenwriters need to become more savvy to audiences that may be desensitized by routine situations and find new innovative ways of covering the same material in a different way. With "Due Date" the writing staff just seemed to go from one extreme to another. Extreme situations that in real life would have serious outcomes, but here they are just taken for granted and forgotten about. Now, I know this is a comedy and should be taken with a grain of salt, but if I'm going to invest my attention in a plot I'd hope there would be some type of follow through and there isn't. That is just covering how a number of the situations needed resolve. Another problem I had with the situations throughout "Due Date" is they feel like they are trying too hard not to be like other movies that came before it. Maybe I'm over-analyzing just a bit, but it feels as if Todd Phillips and the rest of the writing staff were too aware of other movies in similar vein. Films like Tommy Boy or Planes, Trains and Automobiles. Its like The Odd Couple or Grumpy Old Men on the road. These kind of movies go all the way back to The Road To films with Bob Hope and Bing Crosby. "Due Date" felt like it knew these films existed and it didn't want to step on their toes so instead it tap danced around them. The problem is too many of those situations ended up missing the mark or feeling too over the top. Back to the performances for a moment, all of the supporting characters throughout "Due Date" are enjoyable. Small roles by Juliette Lewis, RZA, Danny McBride and Matt Walsh are what make the extreme situations tolerable. Actually that is being a little too rough on the film, the supporting cast help to elevate the comedy from just being okay to enjoyable. McBride and RZA stand out as the best side characters penned for the third Todd Phillips road comedy, two bits that had me in stitches. 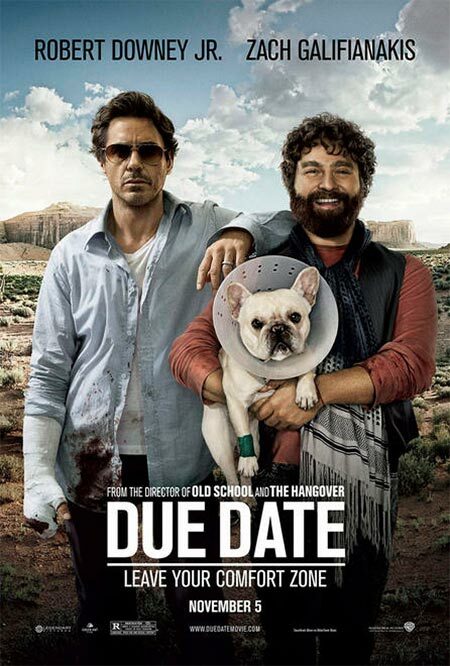 While "Due Date" has two really funny performances from Robert Downey Jr. and Zach Galifianakis plus all kinds of chemistry between the two stars, the comedy ends up being completely forgettable. As much as the film tries to not be a re-tread of similar material, it is. Their are numerous jokes I've seen done time and time again and sadly they've mainly been done better or maybe more effectively. At the end of the day "Due Date" fell very short for me and when ranked would be my least favorite Todd Phillips movie.